I was a speaker at the annual conference of the Organization of Professional Associations (OPA) last week, held along the theme ‘Good Governance – The Way Forward’. Many expressed expectations that are yet to be fulfilled. How should professionals and politicians work together towards progress and prosperity? Leaders and laggards are both in existence. Management and mismanagement are very much in the limelight. Do we see the needed management and leadership in many public and private sector fronts? Many recent events, including labour disputes in the plantation sector, prompted me to reflect more on the intertwined nature of management and leadership in the Sri Lankan context. Any management textbook will give the definition of modern management as “a set of activities, including planning and decision-making, organising, leading and controlling directed at an organisation’s human, financial, physical and information resources, with the aim of achieving organisational goals in an efficient and effective manner.” In essence, it is all about achieving goals, which was the case in ancient times as well. In a crude sense, management can be broken into three parts - man, age and ment. It essentially speaks about people, times and actions. Veteran management thinker Henry Mintzberg often advocates that successful management involves interpersonal, informational and decisional roles. Any organisation can be viewed as a system, comprising inputs, throughputs and outputs. Hence, management can also be defined as human action, including design, to facilitate the production of useful outcomes from a system. This view opens the opportunity to ‘manage’ oneself, a prerequisite to attempting to manage others. Leadership is a much discussed topic in both private as well as public circles. According to R.M. 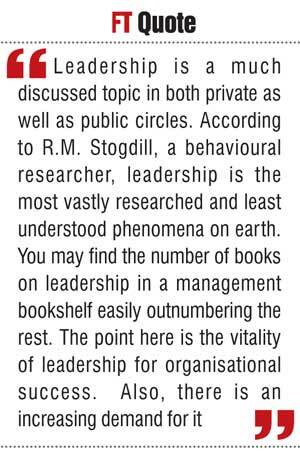 Stogdill, a behavioural researcher, leadership is the most vastly researched and least understood phenomenon on earth. You may find the number of books on leadership in a management bookshelf easily outnumbering the rest. 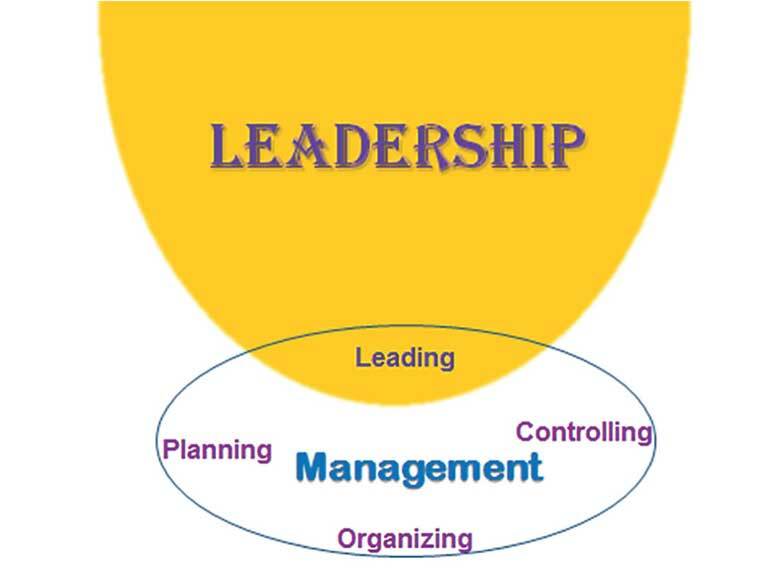 The point here is the vitality of leadership for organisational success. Also, there is an increasing demand for it. Perhaps the only ship that survives a storm is leadership. It is not about positions and titles but about decisions and actions. Leadership is essentially a mindset. We look at the leaders at the top but not the “leaders at the tap”. The dynamics of leadership highlights the leaders and laggards in society showcasing action and inaction. Management essentially is a process. Leadership in fact is a phenomenon. Management has four key pillars, namely planning, organising, leading and controlling. The pillar or function of leading that involves guiding a team and instructing them to achieve set goals is the overlap between management and leadership. Figure I illustrates this connection. Every manager has an opportunity to move beyond the management process in becoming a leader. Every leader has to rely on some elements of management in order to get things done. That’s why we need both managers and leaders in coexistence. There is much evidence from the East and West alike to see this nexus. In the 550 Jathaka stories, a Bodhisattva is portrayed as a leader and a manager in a significant number of cases. The use of physical, human, financial and information resources to achieve the desired goals was the norm. Vannu-Patha Jathaka tells the story of thousands of bullock-carts passing through a desert and running out of water. The leader had to summon the key team to find solutions to the water issue. They searched the area and found a rock, and simply by keeping their ears close to the rock’s surface they could hear water flowing down. They planned and organised resources to dig a well close by and water started to spring out and they were able to quench their thirst. Simply put, this is management in action. In the Bible, particularly in the Old Testament, we can see a variety of stories highlighting managerial and leadership issues. The way Moses took the Israelites out of Egypt in search of a promised land had a variety of episodes of planning, organising, leading and controlling. Making decisions in the face of uncertainty and managing with scarce resources were prominent features of their journey of 40 years. Perhaps the best known Chinese management wisdom comes from the classic masterpiece, the Art of War. Written by Chinese general Sun Tzu in the 6th Century BC, The Art of War is a military strategy book that, for managerial purposes, recommends being aware of and acting on strengths and weaknesses of both a manager’s organisation and a foe’s. It gives practical and sensible advice from the military front which is relevant to market fronts. The pyramids of Egypt, some of which are among the largest man-made constructions ever conceived, constitute one of the most potent and enduring symbols of Ancient Egyptian civilization. It is generally accepted by most archaeologists that they were constructed as burial monuments associated with royal solar and stellar cults, and most were built during the Old and Middle Kingdom periods. Sri Lanka is well known for its ancient water civilisation. The earliest reservoir referred to in the Mahavamsa, the great chronicle of the history of island, was the Jayavapi built during the reign of King Pandukabhaya from 377-307 B.C. The construction of larger scale reservoirs was initiated during the time of King Vasabha from 65-109 A.D. and by 500 A.D. involved very advanced hydraulic structures which would have required sound knowledge of key hydraulic principles pertaining to rainfall, runoff and storage volumes. These are all evidence of management and leadership in action. As in the case of most management concepts, what was practiced for a long time got branded as “servant leadership” in the West. Robert Greenleaf, a scholar from the US, gets the credit for documenting the features and facets of servant leaders. Having worked for AT&T for several decades, he realised the limitations of typical administrative leaders. Having contemplated an alternative, the resulting model was the repackaged concept of servant leadership. Servant-leaders achieve results for their organisations by giving priority attention to the needs of their colleagues and those they serve. Servant-leaders are often seen as humble stewards of their organisation’s physical, financial and most importantly, human resources. “Management is efficiency in climbing the ladder of success; leadership determines whether the ladder is leaning against the right wall,” according to Stephen Covey. It highlights the need to have efficient managers and effective leaders. Do we have them in the Sri Lankan public and private sectors? This brings us to the area of performance. Managers and leaders have to be performers. They should practice what they preach. Leaders should inspire, influence and instruct in such a manner as to initiate result-oriented action. In contrast, laggards are passengers. They hamper the progress by being lazy and lethargic. Indecisiveness resulting in inaction is often common in their approach. Do we see more leaders or laggards? The answer lies in the results they achieve. Let me focus more on the business managers and public administrators leaving politicians aside. It is better to light a candle than curse the darkness. There are a few fundamental questions that need answers. Do our leaders and managers have a clear understanding of what they are supposed to achieve? We should know both the desired level and the current reality. Grappling with issues with confidence as opposed to groping in the darkness is what is required with a lot to reflect on and respond to. I have often emphasised on many platforms the need to have the right person handling the right job. Competencies should be more important than connections. Have we tapped the right talent in assigning crucial tasks? The ample presence of efficient managers and effective leaders on all fronts is a luxury that we do not have. Hence the solution is to develop them in a strategic and comprehensive manner. In essence, management and leadership development should be given more emphasis at the policy level as well as the professional front. We need leaders who genuinely serve and not laggards who grumpily survive.